If you give the moosh to daddy he will likely take her out for ice cream. If the moosh sees ice cream she will likely want chocolate. If the moosh gets dark chocolate ice cream she will want to eat it on the way home. Only dad didn’t realize the moosh was wiped. And that she’d fall asleep in her dark chocolate ice cream. Dad didn’t get a picture of the moosh asleep in her dark chocolate ice cream. But we got a picture of her awake in it. But if you wash the moosh, then she will be clean. And when she is clean, then Mommy will need a break and give her to Daddy. And if you give the moosh to Daddy, well, he will likely take her out for ice cream. did she lick her face for the rest of the night??? I wish I had a kid that fell asleep in the car, how did you do it? Only the good mommies are together enough to take the picture before getting her in the tub! Alli ~Mrs. Fussypants’s last blog post..Fussy is Really Excited About This! and with that gene simmons tongue of hers, i bet she licked herself completely clean! Oh my lawd! This looks just like the last time Elliot had chocolate ice-cream – only she was conscious the whole time and still looked like that. “Toddlerisms” is a great, great word. Most toddlerisms i read about make me convinced I’m doing right by not getting pregnant so soon. Your toddler’s toddlerisms, however, make me hope that my toddlers’ (when and if, etc.) are as lovely. That’s hilarious. I bet it was worth the nap. Such a cute smile. Good luck with cleaning the shirt (that is what my mommy mind is focused on). So cute! Not many things more adorable than a little kid covered in goo. seven’s last blog post..Not So Much The Butterfly… More Like The Dog. Um, you should spend less time blogging and more time worrying if Moosh is lactose intolerant and the seats in your car are stain resistant. First of all, I hope Marty is kidding. 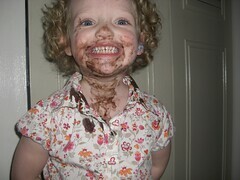 Moosh is so cute and looks so proud of her chocolate face. I love it! Isn’t it nice to fall asleep with something you really love? Besides, is there ANY other way to eat chocolate ice cream than getting it all over everyone and everything? bahaha Oh it is wonderful to laugh this hard in the morning! *giggle* Wow!! Fallin asleep in ice cream. Now that IS a first!! *lol* Thank you for the chuckle, Moosh’s Dad!! I remember Will’s first ice cream cone. Him with black raspberry on a 95-degree day, me in white shorts. Anna at Hank & Willie’s last blog post..Gametime in tripletville! Dads. They’re good for something, just not preventing messes. Oh my gosh! That’s way too funny. I looks like she’s loving it! But she looks so happy to be covered with chocolate. She should be covered in chocolate more often. I LOVE messy messy kids. Just love them! That is just awesome, she looks so proud of herself. And boy does she ever look awake after that dark chocolate. Great picture! I am sure the moosh will appreciate that in a high school yearbook years down the road. Megan’s last blog post..We interrupt this blog to disgust you. Ok, so this is a must show to boyfriends when daughter pisses you off as teen picture. Gotta love it! How cute. She looks quite pleased doesn’t she. STACIESMADNESS’s last blog post..what? That won’t work? Thank goodness Marty! It must do your heart some good to see that we are looking out for Casey and Moosh… Woe be it to the trols that come by here! That is awesome! I would love to have seen the actual dunking. We’re celebrating Danijela’s birthday today with a little party. Last year we had a pancake breakfast & gave everyone “If You Give A Pig A Pancake”. Today it is “If You Give A Pig A Party”. Next year I’m doing nothing. This all stresses me out. Priceless photo! She looks yummy.